Is Your Breeder Running A Legal Business? Is The breeder you are considering buying a puppy from a PUPPY MILL!? 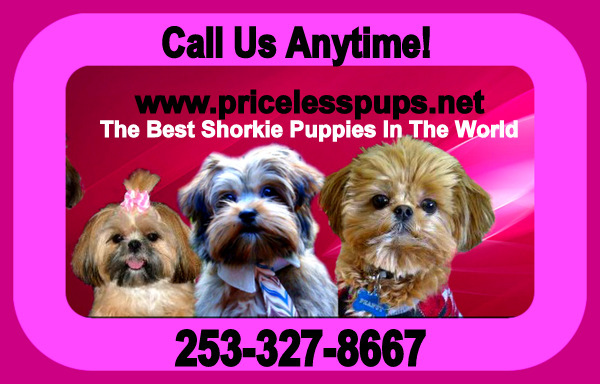 We gets tons of calls each month from puppy parents all over the world that have been ripped off and scammed. Hopefully this will help to prepare you in your search for a new puppy. When you see ON SPECIAL.... or WEEKEND SALE.. or PRICES LOWERED.. you need to be very leery. Especially if the Dogs are older and have not been adopted! ON SALE means they cannot sell their puppies and there may be good reason for it as there may be an issue with the puppies they have available. At Priceless Pups you can be assured that we are a LEGAL business that is ran 1st class at all times we are registered with the department of revenue here in Washington state and everyone gets a access to our business license. We’ll talk to you talk to about every aspect of the adoption process and walk you through it step by step. We ensure you always feel informed, in control, and most importantly, insulated with your legal rights . Our highest concern is for our puppies and our puppy parents. We pride ourselves on being proactive with a proven track record of 23 yrs of successfully handling the needs of our puppy parents and families we service. It takes special types of people to breed dogs. Responsible breeders take all steps to be knowledgeable, licensed, and do not over-breed dogs. That means all the steps . To protect yourself you should always choose a licensed business. Unfortunately most puppy parents overlook the fact that 90 %of the breeders selling dogs online are not a licensed business in the state they live in and are not operating as a legal business which means you have NO RECOURSE and the contract you receive and enter into maybe null and void! So what does that mean for you the consumer?. Well if you are buying from a unlicensed breeder that is running an illegal business online what will at will you do if something should go wrong? These so called fly by night operations that are running illegal operations online are where most puppy parents find themselves being duped into to getting a very sick puppy or no puppy at all. Most of these operations breed several different breeds and are not focused on the betterment of one breed as we are with the Shorkie. Everybody looking for a puppy online should be aware that on most puppy websites there are a lot of so called "back-yard" breeders selling their dogs, breeders that only breed for money and don't care much about their puppies and surely do not care about the puppy parents they are servicing. You will see videos but no individual pictures of puppies or birthdates. This is because they have something to hide. It is important to get as much info on a puppy as possible before you choose a puppy and all that information should be posted and available. One should ask ones self why the breeder they are considering is not registered as a legal business? As of Jan 2010 all Shorkie Club Of America Breeders are REQUIRED to run a legal business that is registered with the state they are working in. As the founder of the Shorkie Club Of America we believe it is important for puppy parents to have the right to know their rights and be protected by the law. Buying from unlicensed breeders that are running illegal business will ensure that you are high risk to be scammed online. If they are not a legal business do not do business! Breeding dogs is a very serious business and should be ran as such. Many of these illegal businesses buy and resell puppies so you really never know where your puppy is coming from. You must understand when looking for a puppy that Internet scammers (BREEDERS!!!) are luring online puppy buyers with cute pictures and false promises, taking would-be dog owners for an emotional and financial ride. Nobody wants to get scammed and lose money or end up buying a sick puppy that costs you thousands of dollars in medical bills. , but with so many online Shorkie breeder and puppy options these days, it can be difficult to tell who is telling the truth and who is lying. The rise of online Shorkie breeder and many dog breeders in general , has also led to a rise in criminals ready to cash in on the unsuspecting. Criminals target Internet users by copying and mimicking legitimate businesses such as ours at Priceless Pups. You would be shocked at the amount of times our photos have been stolen and used by other breeders to try and sell their own puppies. The breeder you work with should have a business license they can provide you with if you ask for one. Don't get scammed online .. Make sure you are dealing with a real business that is registered with the government so that you are protected online. The mass production of irresponsibly bred puppies from non health screened parents should never be condoned – neither should the fact that these mass produced puppies are destined for sale by these unlicensed breeder and illegally ran dog websites. You have a choice the dogs and puppies do not.